Schools out and that could only mean one thing. Festival season is upon us. I look at my schedule and I couldn't be happier with what's going down in North America this summer, especially in Canada. Ontario used to be pretty weak when it came to music festivals. There's no Coachellas, and I'd say there's no Hard Summers if they decide to cancel August in Toronto. 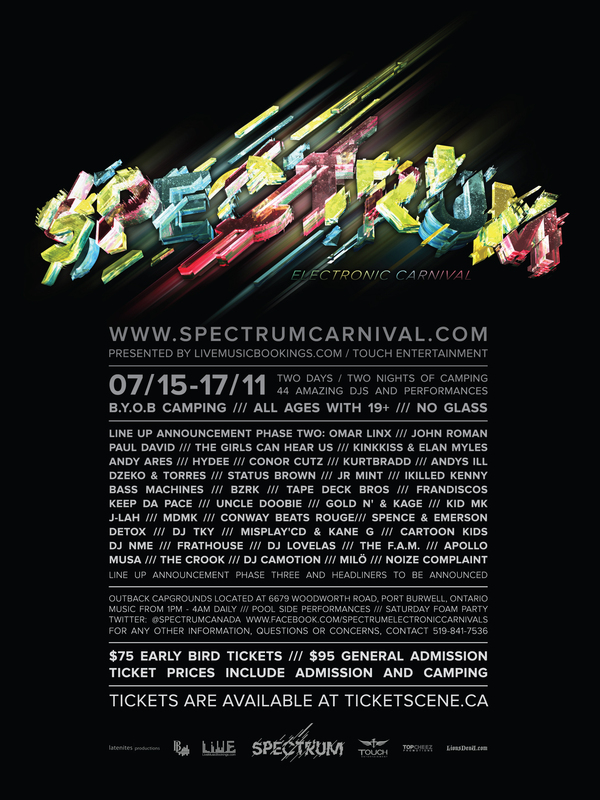 But on top of this massive explosion of EDM in the past year there's one you'll definitely be seeing me at, Spectrum Electronic Carnival. Two nights of camping beside the beaches of Southern Ontario with a massive lineup of local DJs and soon to be announced headliners. Hosted by Live Music Bookings and Touch Entertainment this carnival runs from July 15th to 17th in Port Burwell Ontario. Tickets already went on sale so make sure to grab them on the cheap before the price goes up along with the headliners. I've rumours of big names with big budgets so expect to blown. You can grab advanced tickets below and join the Facebook group so you can be the first to tell your friends when they unleash the headliners.